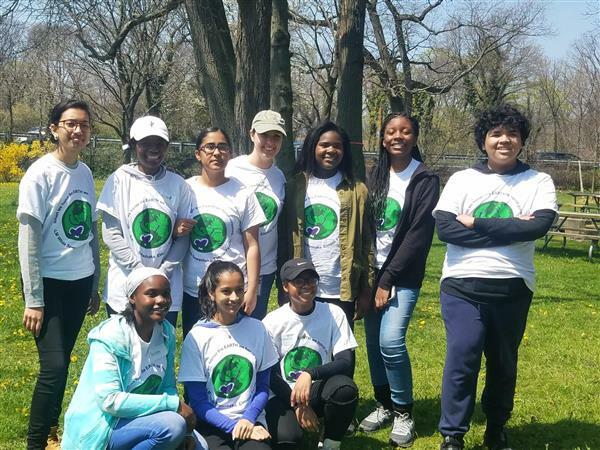 On April 28, several Elmont Memorial Living Environment students and members of Future Scientists of America, led by Mrs. Kathryn Farley, joined forces with Sewanhaka High School’s Key Club and Green Club members, led by Ms. Barbara Wilcox and Ms. Yvonne Sherwood respectively, to honor Earth day. After the morning fog had lifted, blue skies greeted the students as they descended on Northwest Pond in Hempstead Lake State Park. With the help of park manager Mr. Bill Brown, the students removed more than 50 bags of litter along the shoreline. After a two and a half-hour cleanup, the students were invited to Field 1 where they enjoyed each other’s company with lunch, rides on the carousel, and giant games of Jenga and Frisbee. The students were exhausted after an exhilarating day!